After winning an important tournament, the Ducks travel to an exclusive academy for some further education and a chance to flex their hockey muscles. But they find lots of roadblocks in their way, from the strong-armed tactics of the varsity team to a replacement for coach Emilio Estevez. Jeffrey Nordling and David Selby also star. 104 min. Widescreen (Enhanced); Soundtrack: English Dolby Digital 5.1. "Slap Shot" meets "The Bad News Bears" in this surprise hit comedy with Emilio Estevez as a cynical lawyer who's given community service after a driving violation. His duty: coach an inept pee-wee ice hockey team. Along the way, players and coach learn some valuable lessons about winning. Lane Smith, Joss Ackland co-star. 104 min. Widescreen; Soundtracks: English Dolby Digital 5.1, French Dolby Digital Surround, Spanish Dolby Digital Surround. The ragtag bunch of rink rejects who skated their way to a championship (no, not the '94 Rangers!) and coach Emilio Estevez are back for all-new ice-capades, as the Ducks represent the United States in the Junior Goodwill Games hockey event and take on a polished squad from Iceland. Michael Tucker, Kathryn Erbe co-star. 106 min. Widescreen (Enhanced); Soundtrack: English Dolby Digital 5.1. 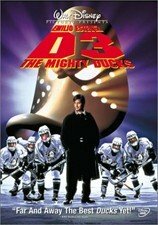 Three-disc set includes "The Mighty Ducks," "D2: The Mighty Ducks" and "D3: The Mighty Ducks."